Striving for peace all around the world. Practicing Peace at Ivan Goran Kovacic School! Peaceful Schools has received a delightful letter from our member school in Niska Banja, Serbia, Ivan Goran Kovacic School. It always gives us great pleasure seeing what each school is doing to create their own culture of peace and we’d like to share their hard work with you! Over the past school year Ivan Goran Kovacic School has participated in activities that promote empathy, acceptance and friendship. Some of their successes have been fundraising money for students that come from low income families, building skills for peaceful conflict resolution through theatre and creating their own tree of friendship to celebrate their school’s love and kindness! These are only a handful of the many other activities the school has participated in over the past year, below are a few pictures highlighting their work. Every year, the students at Kells Academy celebrate Pink T-Shirt Day combined with a fundraiser to make a donation to PSI. Thank you to Kells Academy. We are proud that you are a member of Peaceful Schools International. declare peace on the future. We want a planet free of war and weapons. we want them done away with. we will keep them clear. explore and improve life for everyone. We are for peace, now and forever, for all. Building on the remarkable success of the first edition, the Peace Education Network (United Kingdom) is delighted to present the second edition of Teach Peace revised and updated for 2016. Nadeem Ghazi came to peace education in Pakistan as a practical necessity, an alternative to futility. He was a school administrator in Karachi, one of the world’s biggest cities. Gang warfare, targeted killings and other crime seeped from the roughest neighborhoods to poison ordinary life everywhere. In a poor country where 63 percent of the population of 165 million is under the age of 25, youth found it hard to resist the lures of criminal groups. Schools struggled to cope with behavioral problems, from bullying to students bringing guns to school, Ghazi said. Ghazi has been teaching peace in Pakistan now for more than eight years, including forming his own non-governmental organization called Peace Education Welfare Organization (PEWO). From 2010 to last year, he was a coordinator for a two-year project conducted by Canada-based Peaceful Schools International with a USIP grant. The project, called “From Peaceful Schools to Peaceful Communities in Pakistan,” worked with teachers, students and parents in 25 Karachi schools to instill the knowledge, skills, attitudes, and values required to prevent conflict and create conditions conducive to peace. More than 400 teachers and administrators attended the trainings, and the organizers estimate they reached more than 8,000 students. Sessions focused on topics such as peer mediation, working with parents, and restorative justice, a way of addressing offenses that focuses on identifying what the victims and the perpetrators need and repairing the harm with steps such as paying back money stolen, doing community service, and simply apologizing. The project also aimed to strengthen Ghazi’s own organization to continue similar work on its own in the future. He learned project management, financial management, and program evaluation skills, and gained training expertise that could be passed along to other trainers in Pakistan. PEWO now has more than 100 member schools in Pakistan, Ghazi said. Ghazi has become a master trainer in Pakistan for Peaceful Schools International, coaching other organizations such as Care International and developing collaborations with Peace Direct to strengthen women’s roles in conflict resolution. Both groups are working on peace promotion in Pakistan’s Swat Valley, a traditional tourist destination for its stunning scenery that has been riven by militant violence in recent years. This year, he’s working on a sports-based conflict-resolution project with the British Council in Pakistan called DOSTI, or Friendship, starting with 1,000 students ages 12 to 18 from eight schools. A recent soccertournament inspired the establishment of an academy to keep the work going. But peace can be a risky venture in Pakistan, as the world learned once again last year in the case of Malala Yousafzai. The 15-year-old Pakistani advocate for educating girls was the target of a near-fatal shooting on her way home from school in Swat in October 2012. She was flown to the UK for treatment and now lives there with her family. After multiple surgeries, she celebrated her 16th birthday with a defiant speech at the United Nations in New York, calling on world leaders to guarantee free education for every child. Ghazi has conducted peace education training at Yousafzai’s school in Swat, and in May, he worked in remote areas of Sindh Province. He clearly debates in his own mind the need for peace education in his country versus the risk it poses for him, his family and his co-workers. He has received threats against him, and had to rush a Canadian colleague out of the country after threats from antagonists who thought she was American. One minute Ghazi declares, “I’m a human rights defender. I won’t stop it … I am not afraid of that.” A few minutes later, he concedes that he tries to keep a low profile at times and occasionally fears for his family. He’s convinced education is the most important avenue for addressing Pakistan’s many issues. Viola Gienger is a senior writer at USIP. St. Teilo’s Song for Peace! PSI member school St. Teilo’s High School in Cardiff, Wales has shared with us a new song for peace called We Hold the Key! The song was written and performed by a group of students aged 12-16 from St. Teilo’s. Well done! Check out the link to this wonderful creative song for peace below! Listen to We Hold the Key Here! We have received wonderful news from our regional coordinator in Pakistan, Nadeem Ghazi, about the success of the “Sports for Peace” project by the name of DOSTI(Friendship) with the partnership of British Council Pakistan. Some of the highlights of the program has been their work in various conflict areas with 1000 students from the ages 12- 18 years old. This involved 8 schools in sports for peace activities, especially soccer! Their target is to involve 2000 youth in conflict communities and areas of city in the two year project. They have developed a board of advisory members from the local leadership and community members, for which they will be arranging thematic sessions to teach them about conflict and resolution skills. Peaceful Schools International Pakistan Project has been recently highlighted in Peace Directs newsletter!! A big thank you to all those involved and who support the project! 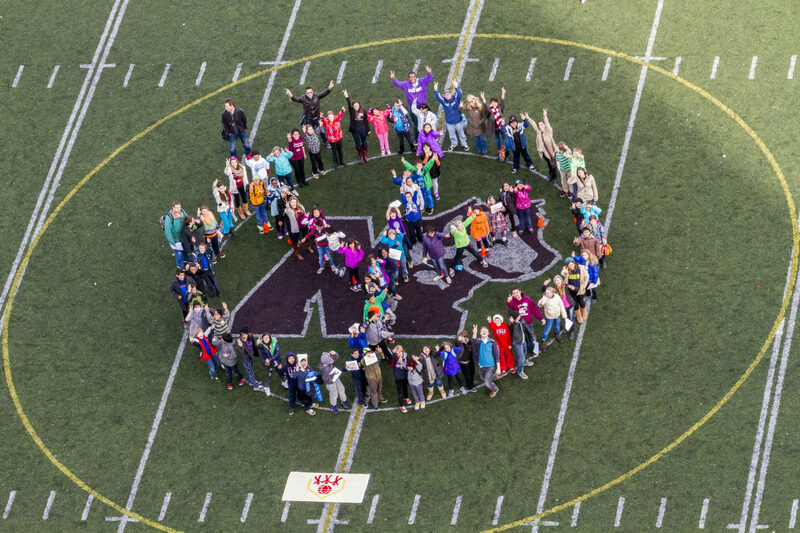 NRHS in Nova Scotia, Canada sent us in this powerful anti-bullying video made by their RESPECT committee in collaboration with the communication committee. The students collected stories from within the school and shared them in the video to create a message of hope and solidarity for those who may be currently suffering from bullying. The video has received great reactions from staff and students and is going to be aired on the local news station! Celebrations for Millstone River School! PSI would like to celebrate Millstone River School in being the first school in the state of Jersey to become a member. We’d also like to share a deep appreciation and pride in March 1, 2005 being declared Peaceful School International Day in New Jersey to honour Millstone River School! After sharing with us the top place papers from their essay contest about peace in their schools it’s easy to see the dedication to creating a peaceful environment. Students speak of the helpfulness of teachers, the friendliness of students and the safety of the school environment which helps them excel at school and maintain their own peace in day-to-day life. Congratulations Millstone River School!